Acer Password Reset | Acer Password Recovery: How to Reset Password on Acer Windows 7 Computer? I locked out of my Acer Windows 7 laptop! I am working on Acer computer with Windows 7. It's locked me out at the password screen. I am pretty sure I am using the right password, but keep getting a message that it's the wrong password. Without the ability to get past the password, I cannot do anything. Is there anyone who can give any advice to help me retrieve my administrator password on my Windows 7 Acer and then get back into the computer? Step 1. Get a Windows 7 installation disc or any bootable media that can support us access to Command Prompt. If we don't have one, go to another available Windows 7 computer and create a System Repair disc by pressing the WinLogo+R keys and run RECDISC. Just keep it blank and confirm it. If you see the message "The command completed successfully", close the Command Prompt. You should now be able to log in to the account without a password. If password is not strong enough and we can try Ophcrack via site: http://ophcrack.sourceforge.net/ . Just burn it to a CD or create a bootable flash drive and boot from one of them. Step 1. Download Windows Password Recovery Tool, install it and run it on an accessible pc from website http://tinyurl.com/windows-passwords-recovery . Step 3.Set locked Acer Windows 7 computer start from burned disk after BIOS setting. 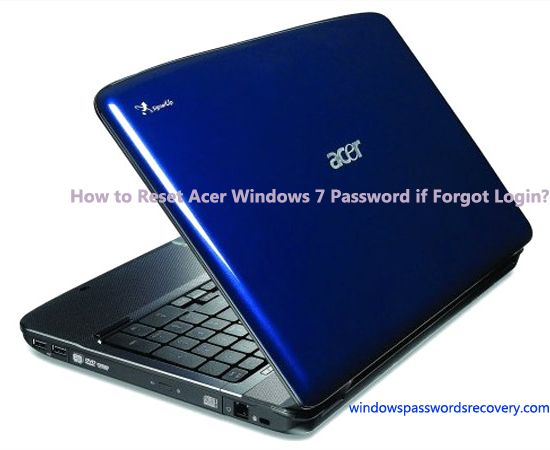 Then restart Acer computer, recover lost Windows 7 password within clicks. Here's a Youtube tutorial on Acer password reset for Windows 8/7/Vista/XP if you are interested: http://youtu.be/KFtEjSqldBY .